Animagine resources - .Film and Video Workshop..Film and Video Workshop. This web resource provides detailed advice on how to use our DVD in the classroom. It is adapted from our booklet that comes with the DVD and contains more up to date information and additional material and downloads. If you have been using this resource we would appreciate any feedback and any advice you might want to pass on to your colleagues in the form of lessons plans etc. 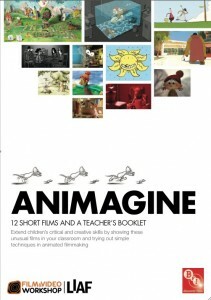 An introduction to the Animagine Teacher’s Booklet, including sections on ‘Why teach about films?’ ‘Why teach about animated films?’ and ‘What can children learn from animated films? This area includes sections on ‘Preparing for the viewing’, Preparatory Activities’, ‘Organising the viewing’, ‘Strategies for viewing’, Making the most of classroom talk’ and ‘Following up’. 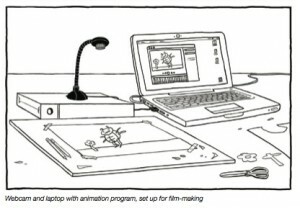 This area includes sections entitled ‘Not confident with IT?’, ‘What technique should I use?’, ‘Three easy options for doing entry level animation in the classroom’, ‘Explaining the basic principle of animation’, ‘First steps’, ‘Storyboards’ and ‘Animation Techniques’. Each films synopsis and film makers notes along with specific teaching guidance. The area is contains a ‘Teacher’s Crib Sheet’ which provides you with some background information and vocabulary to support your own thinking about the films as well as children’s discussion and analysis of the films. Each term is given a general definition and most of the words are also illustrated with examples from the films on the DVD.